The board structure is highly customizable and defines the workflow for that board. A column is often perceived as a status for Cards, where you drag & drop a card to another column to signal a change of state. Columns can be added, edited and sorted to fit most workflows. To edit a column, press the arrow next to it. To add a new column, press the "+" symbol. On a deeper system level, a column can have either of 4 system states which are used for reporting and in automatic triggers. You can edit the column system state ("Set cards in this column to.."), by selecting either of "Completed", "In progress", "Not started" or "Not Specified". 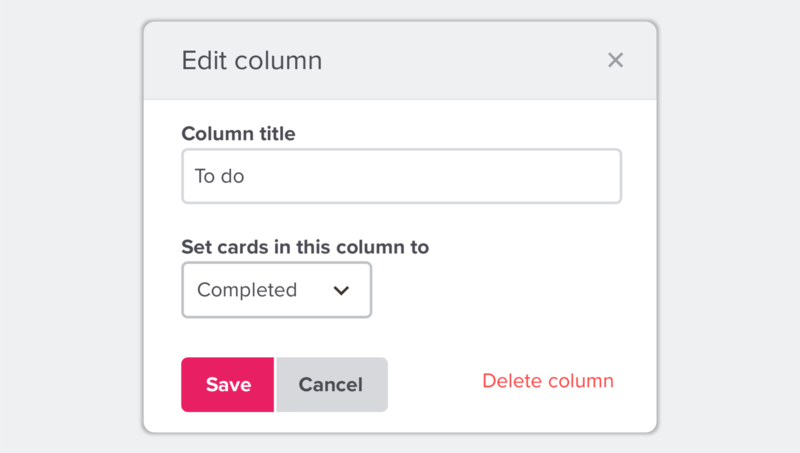 A Column with a system state of "Completed" will take control over any card that gets completed. You will notice that the card will automatically move itself over to the "Completed" column. To prevent cards from moving around when you complete them, you will have to locate the "Completed" column and change its system state to something else. Rows can be used to separate your cards into different categories, e.g. different rows for different marketing channels. To use rows, click on the arrow next to the board name, choose "Board settings" and click "Enable rows". Colors are a simple way of differentiating Cards in a visual, easy to spot, manner. There is no magic behind the colors, it's simply a visual aiding tool.